Is the surge likely to continue? It's been a difficult first quarter for the industrial sector, with China's growth slowing, talk of an industrial recession in the U.S., and the European Central Bank cutting interest rates to stimulate Europe's economy. Yet somehow, industrial supply companies MSC Industrial Direct Co. (NYSE:MSM), Fastenal Company (NASDAQ:FAST), and W.W. Grainger Inc. (NYSE:GWW) are up an average 16% in 2016. What's going on, and can it continue? We now expect fiscal 2016 total sales to decline in the range of 20% to 23% and organic sales to decline in the range of 10% to 13%. Previously, total sales decline was projected to be in the range of 10% to 14% with organic sales decline of 6% to 10%. Regular Fool readers already know how conditions remained soft at MSC Industrial in the fourth quarter, and that Wesco International (NYSE:WCC) saw deterioration in core sales growth in all of its key end markets. Meanwhile Fastenal's fastener sales -- around 40% of its total business and the key to its industrial business -- declined 6.2% in the fourth quarter. However, markets tend to anticipate economic conditions, and the appreciation of the industrial supply sector -- usually seen as highly cyclical -- is an indication the market is pricing in some sort of recovery in the second half. But is there any evidence for this? U.S. macroeconomic data suggests a bottoming process is forming. 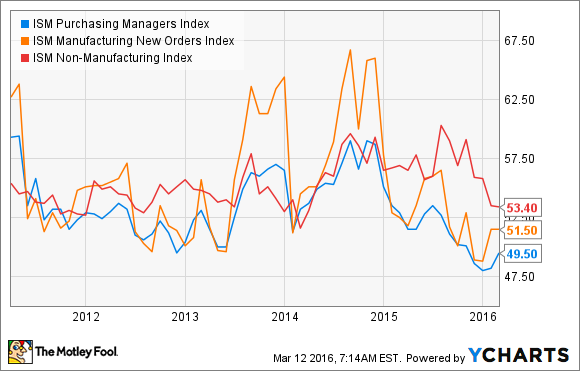 The widely followed Institute for Supply Management (ISM) data has been a bit more positive lately. Monthly sales trends and anecdotal evidence from the industrial supply companies suggest a recovery in the second half. A look at U.S. industrial and manufacturing production suggests, albeit tenuously, that a trough was formed in December. Recall that the company results discussed above encompassed this period, so relatively better conditions could show up in future earnings figures. Hard macroeconomic data is also backed up by the ISM survey data. As you can see below, manufacturing has picked up a bit in 2016 (index readings above 50 indicate expansion) and the non-manufacturing index remains in positive territory. Wesco International CEO John Engel outlined how its request-for-proposal activity level grew successively each quarter in 2015. In this case, RFPs are solicitations for industrial supply companies to submit business proposals. Meanwhile, on MSC Industrial's earnings call, CFO Rustom Jilla suggested that average daily sales would be down 4% in January and February -- not fantastic, but better than the 5.9% decline reported in November. Fastenal always gives great monthly data. Here is a chart of daily sales growth for its stores open more than five years (it's better to use mature stores to analyze sales data). DATA SOURCE: FASTENAL COMPANY PRESENTATIONS. A look at Grainger's daily sales growth in U.S. stores reveals very similar sales trends. DATA SOURCE: W.W. GRAINGER, INC COMPANY PRESENTATIONS. 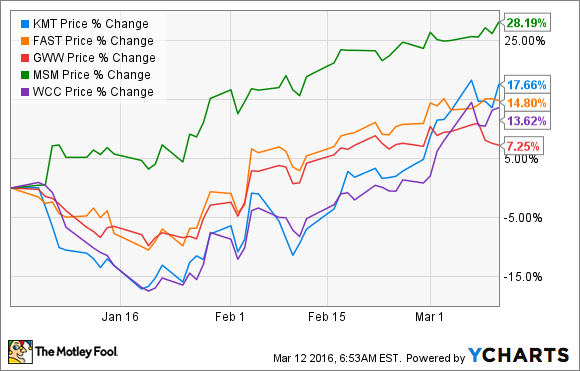 Where next for the industrial supply companies? There is no guarantee that the tentative trends outlined above will continue in 2015, so it's probably too early to get out the bunting. On the other hand, it looks like the U.S. could be over the worst of the industrial slowdown. Moreover, the industrial supply companies will have weaker numbers to compare with going into the second half of 2016. For investors looking to play this theme and jump in ahead of the next move upward in a sector, it's probably a good idea to focus on broader industrial stocks with a heavy U.S. focus. The industrial supply companies are always early in the cycle, and their stock price movements and sales trends could be signalling a better second half for the industrial sector.